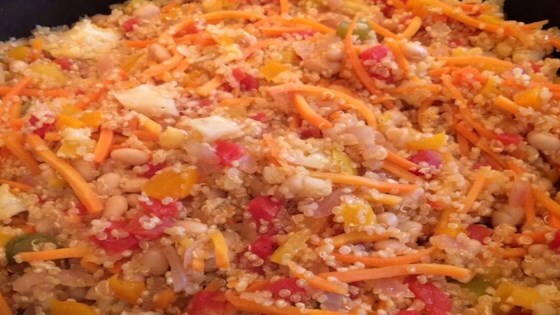 "This quinoa dish is easy, tasty, and very adaptable. You can change the veggies to just about anything you like and step up the heat if you like it spicy. Virtually impossible to mess it up! Serve hot or cold and top with hot sauce (such as Secret Aardvark™ Habanero Hot Sauce)." Heat oil in a deep pan over medium-high heat. Saute carrots, celery, bell pepper, and onion until crisp-tender, about 5 minutes. Add beans, tomatoes, broth, quinoa, giardiniera, garlic powder, salt, and pepper. Bring to a boil. Turn down to a simmer and cook until most of the liquid has been absorbed, about 20 minutes.